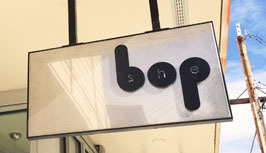 Throughout the month of May, 10% of all purchases made at She Bop on Tuesdays will go to TransActive’s In A Bind program! TransActive is a Portland-based non-profit that provides a wide range of services to transgender and gender nonconforming children, youth, and their families. Their In A Bind program, which just launched in March, provides chest binders to trans-masculine youth in need. It is the first national chest binder donation/distribution program, and the requests for binders are already rolling in. All proceeds from this fundraiser will be used to purchase binders from our distributor and donate them to TransActive. We will also have a drop-off box in the shop where you can donate binders! And don’t miss the launch party for the In A Bind program, hosted by Basic Rights Oregon at Hamburger Mary’s on June 7th from 6 to 9 p.m.